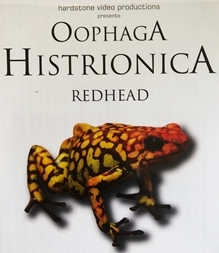 Fantastic new DVD (£16.99) /Blu-Ray (£21.99)on the stunning Harlequin poison dart frog (Oophaga histrionica Red Head)just arrived in stock. • TUESDAY 26th MARCH 2019 WILL BE THE LAST DAY OUR SHOP IS OPEN TO THE PUBLIC. WE WILL BE MOVING PREMISES AND OPEN AGAIN IN LATE APRIL / EARLY MAY. WE MAY BE AVAILABLE FOR AMPHIBIAN PICK-UPS - PLEASE CONTACT US BY EMAIL (OUR ONLY METHOD OF CONTACT DURING THIS PERIOD). PLEASE WATCH THIS SPACE FOR FURTHER INFORMATION ABOUT THE NEW SHOP.